Authorized and funded by the Colorado Department of Local Affairs, the South Platte Master Plan was launched two years ago to find ways to make the river more “flood resilient,” both to handle the flooding as it occurs, with minimal damage to property and structures, and to quickly recover from a flood in the aftermath. The project area includes 130 miles of the South Platte River from the Weld-Morgan County Line to the Nebraska state line. Project representatives will present the plan Feb. 12 at the Lower South Platte Water Conservancy District’s board of directors meeting at 9 a.m., then meet with the Logan County Water Conservancy District board at 11 a.m. The plan will be presented again at 1 p.m. at the CSU Engagement Center. The LCWCD recently decided to change its focus away from the idea of building a flood control dam across Pawnee Creek. Miller has said the “big project” simply isn’t feasible and may not be for some time. Instead, the district will shift its focus to smaller projects that will mitigate flooding in the immediate future. 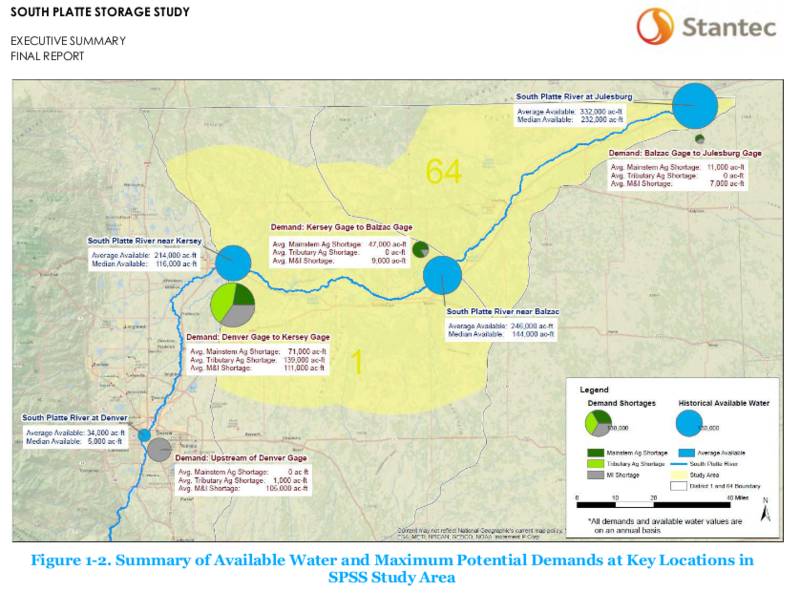 The Lower South Platte district, meanwhile, is interested in finding water storage potential and funding for storage projects along the lower reaches of the river. The meetings on Feb. 12 are public meetings but space is limited in all of the venues. Brad McCloud, a public relations specialist with EIS Solutions, told the Sterling City Council Tuesday evening that the Logan County Water Conservancy District is shifting its focus away from a single large project to a series of smaller ones. 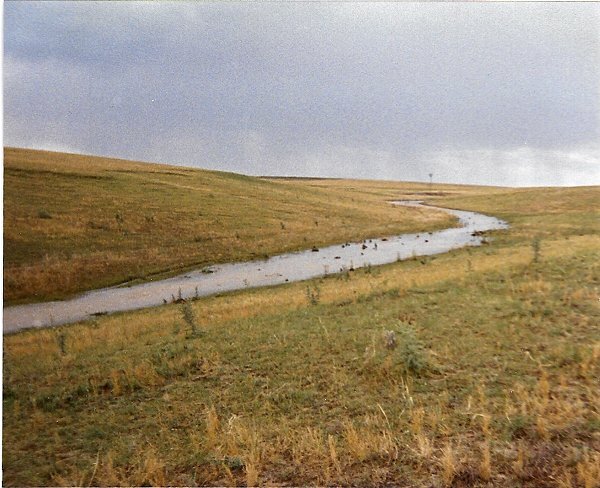 The conservancy district was formed in 2000 after flash flooding of Pawnee Creek in the spring of 1997 caused widespread damage in the Sterling area. The district was formed specifically to mitigate flooding in the Pawnee Creek drainage area of Logan and Weld Counties. The centerpiece of the district’s efforts at that time was a proposed dam 131 feet high and 6,800 feet long across the Pawnee about a mile north of where the creek passes under Colorado Highway 14, 11 miles west of Sterling. In the case of a flood along the order of the 1997 event, which flooded southern parts of Sterling, the dam would hold back about 90,000 acre-feet of water. McCloud said the LCWCD hopes to work closely with the Lower South Platte Water Conservancy District, which is looking into water storage possibilities in the basin. Although LCWCD isn’t legally allowed to store water for irrigation or recreational uses, McCloud said some of its work may fit with projects that would be proposed by Lower South Platte. LCWCD also will work closely with the sponsors of the South Platte River Master Plan, which was developed in 2017 to find ways to mitigate flooding damage on the river in Morgan, Washington, Logan and Sedgwick counties. The Lower South Platte Water Conservancy District’s board of directors tentatively accepted the 2019 budget. Technically, the district’s budget will soar to $1.35 million next year, but like the 2018 budget, much of that is in the form of grants for specific water study projects. The district will manage almost $350,000 in Colorado Water Conservation Board grant funds to create the South Platte Regional Development Concept. 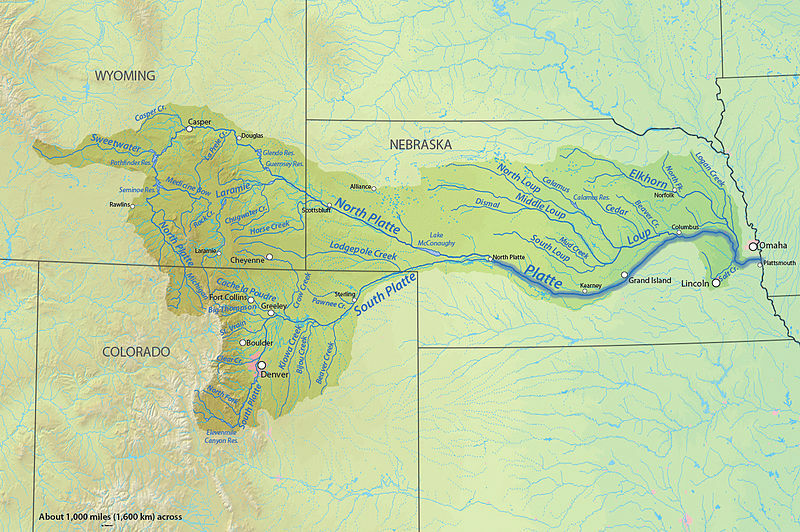 The project, being done by the South Platte Regional Opportunities Working Group, would help identify viable water storage projects in the South Platte basin. Another grant, this one for $236,245 from the U.S. Bureau of Reclamation, would be used by the Northeast Colorado Water Cooperative to find ways to develop infrastructure for water exchanges, primarily when water augmentation plans are involved. The $1.35 million figure also includes $316,312 in leftover funds from the 2018 budget. Actual operating expenses for the conservancy district are budgeted at just under $760,000 for 2019. The Lower South Platte Water Conservancy District will submit a proposal to act as fiscal agent for the Water Supply Reserve Fund Proposal being drawn up by the South Platte Regional Opportunities Working Group. That decision came during Tuesday’s meeting of the district’s Executive Committee. The $390,000 project, described in the nearly impenetrable technical language of water experts, is essentially the next step after the South Platte Storage Study, which was completed late last year. 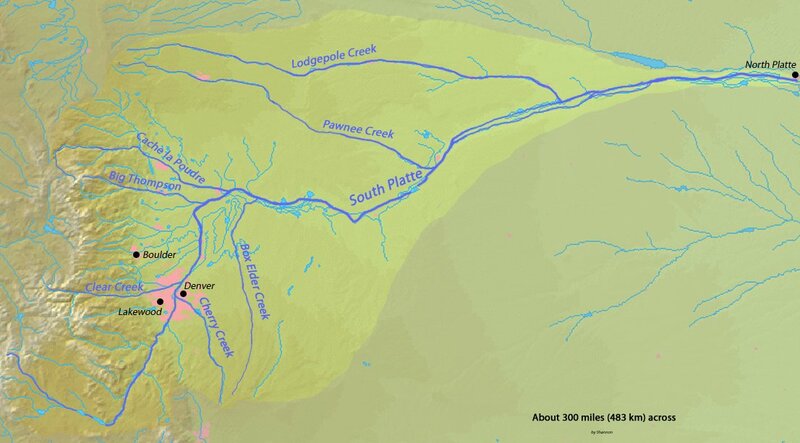 The study, authorized by the Colorado General Assembly in House Bill 16-1256, looked at the stretch of the South Platte River between Kersey and the Nebraska state line in an attempt to find water storage to fill a crippling water gap that is just 12 years away. According to the 2015 Colorado Water Plan, by 2030 the need for water in Colorado will exceed supplies by 560,000 acre feet, or 182 billion gallons per year, and most of that is here in the South Platte River Basin. Joe Frank, general manager of the LSPWCD, said the study is good at indicating what can or should be done to meet the growing water gap, but it says nothing about how to do it or by whom. And it’s the “by whom” part that needs to be addressed next, Frank said, because without an entity to fund an promote projects, nothing gets done. The new project first establishes a fiscal agent and project sponsors, initially SPROWG members, to prepare a funding proposal and a work plan. It’s that fiscal agent part that Frank asked his executive committee to consider. LSPWCD was the fiscal agent on the South Plate Storage Study; the job entails making sure funds are paid to the right people at the right time and are properly accounted for. South Platte River near Kersey September 13, 2009. The district’s board of directors approved the resolutions by a 9-0 voice vote. The district levies one-half mill on all property within the district, which includes parts of Morgan, Washington, Logan and Sedgwick counties. The budget itself was formally approved by the board’s executive committee during the November meeting. For the first time in the district’s history the budget has inched up over the $1 million mark, although a large chunk of that is for grants for specific projects in 2018. The bottom line on the budget is $1,024,992. The district will use almost $350,000 in Colorado Water Conservation Board and U.S. Bureau of Reclamation funds to help the Northeast Colorado Water Cooperative find ways to develop infrastructure for water exchanges, primarily when water augmentation plans are involved. The budget also contains $269,107 for contingency reserve, a capital reserve of $20,000, and a TABOR reserve fund of $10,000. Subtracting the reserve funds and project grants from the $1,024,877 budget proposal leaves a little more than $376,000 for district operations. On the revenue side, the district anticipates a 4.3 percent increase in general property tax revenues based primarily on higher valuations for property as opposed to greater value because of development. The budget includes a separate budget for the Julesburg Recharge Project, which is a subsidiary of the LSPWCD. Although all of the funds for the JRP are contained within the overall LSPWCD budget, they are accounted separately. The JRP began in 1990 as a recharge demonstration project. In 1993 it was incorporated into the LSPWCD as a water activities enterprise. That means participating well users pay for all costs associated with the recharge project and well augmentation while LSPWCD manages the project and provides water and financial accounting for the augmentation plan. 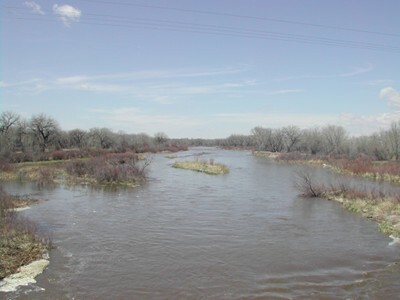 The Platte River is formed in western Nebraska east of the city of North Platte, Nebraska by the confluence of the North Platte and the South Platte Rivers, which both arise from snowmelt in the eastern Rockies east of the Continental Divide. Map via Wikimedia. The Lower South Platte Water Conservancy District’s budget will exceed $1 million for the first time in 2018. The district’s Board of Directors Executive Committee got its first look at the proposed budget during Tuesday’s meeting. District manager Joe Frank pointed out that the budget is somewhat inflated by two grants totaling more than $341,000 the district has received, one from the Colorado Water Conservation Board and one by the U.S. Bureau of Reclamation. The CWBC grant will be used to match the USBR grant to help develop a marketing plan for the Northeast Colorado Water Cooperative. The district also will enjoy about a 4 percent increase in general property tax, mostly from increased valuations on real estate. Total increase in the budget is about $70,000, or roughly 6.8 percent over this year’s budget, which also contained large water study project grants. The Bureau of Reclamation grant of $236,245 is one of nine the bureau awarded earlier this month as part of its WaterSMART Water Marketing Strategies program. …pumps and pipelines cost money, Frank said, and a lot of it, and that means heavy participation by everyone who needs water. The “water marketing strategy” the NECWC has in mind would try to expand participation with municipalities and industrial water users who are not yet part of the cooperative. Northern Integrated Supply Project (NISP) map July 27, 2016 via Northern Water. The Lower South Platte Water Conservancy District’s board of directors decided Tuesday to not object to a plan to move the proposed Galeton Reservoir from its original site. 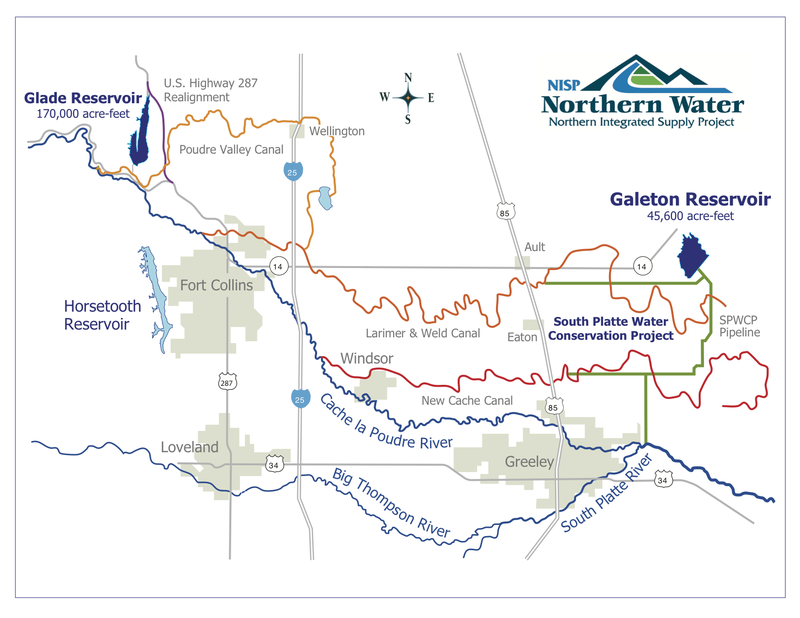 Galeton is part of the Northern Colorado Water Conservancy District’s controversial Northern Integrated Supply Project, which would use water from the Cache la Poudre and South Platte rivers to irrigate, provide domestic water, and bolster the Poudre through Fort Collins. Northern Water originally planned to build the reservoir on the southeast side of Colorado Highway 14 near Galeton, but in the 10 years since the project was proposed Nobel Energy has drilled almost two dozen oil and gas wells in the area. Those wells would have to be capped, at tremendous cost to Northern, in order to use the site for a reservoir. Northern has applied to have the water rights instead transferred to land on the northwest side of the highway. LSP board member Brad Stromberger, who also is on the Northern board of directors, said the Berthoud-based water district is “in the design stages” on the project already and plans to begin construction on the reservoir within about five years. The LSP’s water lawyer, Kim Lawrence, had recommended that the district file an objection to Northern’s request. Such objections are commonplace primarily to get access to crucial engineering and financial information about water projects. LSPWCD has previously gone on the record as being entirely in support of NISP, and during Tuesday’s meeting the district’s manager, Joe Frank, cautioned that objecting to the change in the Galeton application could be used by NISP opponents to claim that the lower South Platte doesn’t support NISP.